Kagyü (Tib. བཀའ་བརྒྱུད་, Wyl. bka' brgyud) — one of the four main traditions of Tibetan Buddhism. The Kagyü tradition is one of the ‘Sarma’ or ‘new’ schools that mainly follow the tantras translated during the later transmission of the Buddhadharma to Tibet around the 11th century. Often called ‘the Practice Lineage’, the Kagyü tradition places great emphasis on intensive meditation practice, and on guru yoga, the power of devotion and the transmission from master to disciple. Apart from Tibet and all across the Himalayan regions, the Kagyü tradition has a very strong following in South East Asia and Malaysia, and has long since taken root in the West. The name ‘Kagyü’ is sometimes said to refer to ‘the lineage of the four instruction transmissions’ (kabab shyi gyü) held by the mahasiddha Tilopa from Bengal. Tilopa received teachings directly from the primordial buddha Vajradhara, of whom he is also said to be an emanation, as well as from a number of human gurus. Tilopa transmitted his lineage to Naropa, a learned scholar and the ‘northern gatekeeper’ at Nalanda, who underwent a famous set of hardships during his arduous training with his master. Naropa systematized Tilopa’s teachings into ‘the six dharmas of Naropa’: inner heat (tummo), illusory body, dream, luminosity, phowa and bardo. These vajrayana methods, along with the profound meditation practices of Mahamudra, form the core of the Kagyü teachings. The source of this tradition in Tibet was the translator Marpa Chökyi Lodrö (1012-1099), who travelled several times to India and Nepal, and studied with Naropa and his disciple Maitripa. The greatest of Marpa’s four chief disciples was the extraordinary yogi, poet and saint Milarepa (1040-1123), who has been a source of inspiration for millions of Buddhist practitioners, and whose life-story and Hundred Thousand Songs stand out as classics of world spiritual literature. Milarepa’s two closest students were the yogi Rechungpa Dorje Drak (1084-1161), and the scholar Gampopa, or Dagpo Lhajé (1079-1153) from whom the Dagpo Kagyü tradition took its name. Physician, scholar, and monk, Gampopa brought together the Kadam tradition stemming from the teachings of Atisha (982-1054) with Milarepa’s oral instructions. He founded the monastic order of the school, and wrote the renowned text on the graduated path The Jewel Ornament of Liberation. From four of Gampopa’s outstanding disciples are traced the four earlier Kagyü schools: Barom, Phagdru, Karma and Tsalpa. 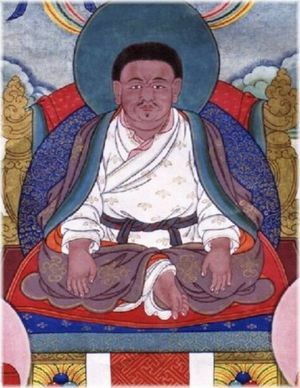 One of Gampopa’s students, Phagmodrupa Dorje Gyalpo (1110-1170) founded the Phagdru Kagyü tradition and the first great Kagyü monastery of Densatil in South Tibet. From his disciples came the eight later Kagyü traditions: Drikung, Taklung, Yabzang, Trophu, Shugseb, Yelpa, Martsang and Drukpa. The traditions that thrive as major independent schools today are: the Karma Kagyü or Kamtsang, Drukpa, Drikung and Taklung. The Karma Kagyü tradition began with Düsum Khyenpa (1110-1193), a student of Gampopa who came to be recognized as the ‘Karmapa’, “the one who performs the activity (karma) of all the buddhas”, predicted by both Buddha and Guru Rinpoche. Dakinis offered him a 'Vajra Crown', woven from their own hair. At the age of 79, he founded the Tsurphu monastery in Central Tibet, which became the seat of this lineage. His incarnation, the 2nd Karmapa, Karma Pakshi (1204 -83) is regarded as the first tulku in Tibet, and was a teacher of Möngke Khan, the Mongol Emperor. The Karmapas continue as a line of extraordinary saints, scholars, authors and artists, down to and including the current 17th Gyalwang Karmapa. Of towering spiritual achievements, they have played a huge part in the flourishing of the study and practice of Buddhadharma, and in the history of Tibet. The 3rd Karmapa, Rangjung Dorje (1284-1339), was a remarkable siddha, scholar and writer, and a great exponent of Mahamudra and Dzogchen. Deshyin Shekpa, the 5th Karmapa (1384-1415), was offered a physical Vajra Crown by the Yong Le Emperor of China, which has been used in the Vajra Crown Ceremony ever since. The 14th Karmapa was a significant figure in the Rimé renaissance of Buddhist culture in Tibet, as was the 15th, Khakhyap Dorje (1871-1922), who was a disciple of the great Jamgön Kongtrul Lodrö Thayé (1813-1899). The 16th Karmapa, Rangjung Rigpé Dorje, left Tibet in 1959 and rebuilt the Rumtek monastery in Sikkim in 1962, making it the seat of the Karma Kagyü in exile. Through his vision and action, the future of the Kagyü tradition was ensured, despite the tragic events of the time in Tibet, and he played a major role in establishing the Kagyü School in both the East and West. He passed away in Chicago in 1981. There are many other great incarnate lamas belonging to the Karma Kagyü tradition. Kunzig Shamar Rinpoche is the 14th incarnation of the main disciple of the 3rd Karmapa, who presented him with the red crown, giving him the name Shamarpa ‘holder of the red crown’. The 12th Tai Situ Rinpoche’s incarnation line goes back to the 15th century, the 8th Situ Panchen Chökyi Jungné at Palpung monastery having played a huge part in revitalizing the Karma Kagyü lineage in Eastern Tibet. The Goshir Gyaltsab Rinpoches have always served as Vajra Regents for the Karmapas and their monasteries. Other important incarnate Karma Kagyü masters include such figures as the incarnations of Jamgön Kongtrul, Pawo Rinpoche, Sangyé Nyenpa Rinpoche, Yongé Mingyur Dorje, and the Surmang Gharwang and Trungpa incarnations. Chögyam Trungpa Rinpoche, the 11th Trungpa tulku, was a key figure in the spread of the Kagyü tradition in the West. Two extraordinary scholars, who have trained the great Karma Kagyü lineage holders, are Khenchen Thrangu Rinpoche (b. 1933) and Khenpo Tsultrim Gyamtso Rinpoche (b. 1934). The Drikung Kagyü was founded by Phagmodrupa’s close disciple, Kyobpa Jikten Sumgön (1143-1217), who established the Drikung Thil monastery in Central Tibet, the main seat of the tradition. His teachings were gathered into a celebrated work called Gong Chig—‘Single Viewpoint’. The Drikung School produced many other extraordinary saints and scholars, such as: Dorje Drakpa, Gyalwang Kunga Rinchen, and the tertöns Chögyal Rinchen Phuntsok, and Drikung Orgyen Nüden Dorje. At first hereditary, from the 17th century the leadership became an incarnate line through the Chetsang and Chungtsang Rinpoches, continuing to the present day with the 7th Drikung Kyabgön Chetsang Rinpoche and 8th Drikung Kyabgön Chungtsang Rinpoche. Born into the Gazi ancestral lineage, Taklung Thangpa Tashi Pal (1142-1210) received Phagmodrupa’s complete oral teachings. He founded the Taklung Dorje Den monastery, and was known for the saintliness and purity of his life. 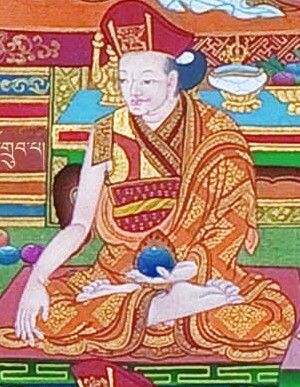 The Taklung Kagyü lineage has been blessed by many great masters, such as: Kuyel Rinchen Gönpo (1191-1236), Sangyé Yarjön (1203-1272), Sangyé Wön Drakpa Pal (1251-l296), who built the Riwoche monastery in Kham, noted for having colleges for the study of the different schools of Tibetan Buddhism, and the 7th Riwoche Jedrung Jampa Jungné (1856-1922). The Taklung monastery in central Tibet and the Riwoche monastery each had three main lamas or Kyabgöns: in Taklung, there were Shabdrung Rinpoche, Matrul Rinpoche, and Tsetrul Rinpoche; and at Riwoche, Phakchok Rinpoche, Jédrung Rinpoche, and Riwoche Shabdrung Rinpoche. Currently the lineage is headed by the 7th Phakchok Rinpoche, the 7th Taklung Matrul Rinpoche, and the 26th Taklung Shabdrung Rinpoche. The Drukpa Kagyü tradition originated with Lingré Pema Dorje (1128-1188), called ‘the Saraha of Tibet’, and a disciple of Phagmodrupa. It was his student Tsangpa Gyaré Yeshe Dorje (1161-1211) who had the vision of nine roaring dragons in the sky which inspired the name of this tradition, the Drukpa ('Dragon') Kagyü. He is regarded as the 1st Gyalwang Drukpa, or Drukchen Rinpoche. His disciples included Gyalwa Götsangpa (1189-1258), who created the Upper Drukpa lineage, and Chöje Lorepa (1187-1250), founder of the Lower Drukpa lineage, and the disciples of the 2nd Drukchen numbered the three ‘crazy wisdom yogins’ Drukpa Kunley, Ü Nyön and Tsangnyön, as well as Thangtong Gyalpo. One of the greatest scholars of Tibetan Buddhism was the 4th Drukchen, the ‘Omniscient’ Pema Karpo (1527-1592). The Gyalwang Drukpas continued in a line of extraordinary realized masters down to the present head of the lineage, the 12th Gyalwang Drukchen (b. 1963). One of Pema Karpo’s emanations, Shabdrung Ngawang Namgyal (1594-1651), became the spiritual and temporal ruler of Bhutan, establishing the Drukpa tradition as the state religion; the present head of the Central Monk Body is the 70th Je Khenpo, Trulku Jigme Chhoeda. Many great Drukpa Kagyü masters shaped the future of the tradition. The 8th Khamtrul Rinpoche, Dongyud Nyima (1931-1980), mystic, scholar and expert artist, continued the traditions of his Khampagar monastery at Tashijong in India, famous for its togdens or realized yogins. Other masters of immense significance have been the great yogin Drukpa Thuksey Rinpoche (1916-1983), and the 8th Trulshik Adeu Rinpoche (1931-2007), holder of the Kham Drukpa lineage, as well as many others, including Dorzong Rinpoche, Drugu Choegyal Rinpoche, the Drukpa Choegon Rinpoches, Drukpa Yongdzin Rinpoche, Apho Rinpoche, and Drubwang Tsoknyi Rinpoche. The Shangpa Kagyü lineage had entirely different origins. It was established by the great yogi and siddha Khyungpo Naljor (990-1139), who spent fifty years studying in India, Nepal and Tibet. Among his many teachers were the two wisdom dakinis, Sukhasiddhi and Niguma, the consort of Naropa. 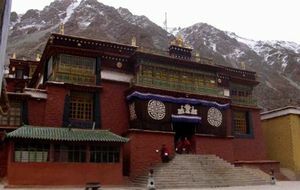 He founded the principal monastery of the school at Shyong Shyong in the Shang valley. The Shangpa lineage later divided into several branches, the two most important being those transmitted through Thangtong Gyalpo and Taranatha (1575–1634); these were all gathered by Jamgön Kongtrul. The Shangpa Kagyü no longer exists as a separate lineage; Kalu Rinpoche (1905-89), an incarnation of Jamgön Kongtrul, played a vital part in the world-wide spread of the Karma Kagyü and Shangpa teachings, and the Shangpa lineage was continued by the 3rd Jamgön Kongtrul Rinpoche (1954-92) and Bokar Rinpoche (1940-2004). 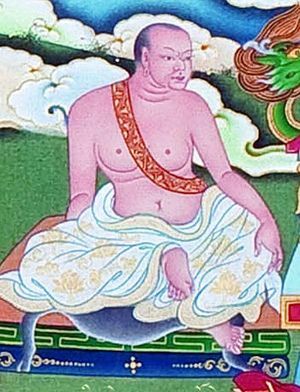 Milarepa's main disciple, Gampopa, aka Dakpo Lharjé (1079-1173), brought together the Drupgyü and Kadampa lineages, thus founding the Dakpo Kagyü school. This lineage was later subdivided into four schools by his four main disciples. Pagdru Kagyü, founded by Phagmodrupa Dorje Gyalpo (1110-1170). Drikung Kagyü, founded by Drikung Kyobpa Jikten Sumgön (1143-1217); it included the Lhapa sect, builders of the earliest dzongs in Bhutan, later eclipsed by the Drukpa. Today, only the first three of these eight Pagdru Kagyü sub-schools remain; these three are also the closest to the Nyingma school, with which sharing a large number of transmissions. Note: the Shangpa Kagyü school, although very similar to the Dakpo Kagyü school, is different in its Indian origins and practices. However, during the nineteenth century, these two lineages merged into one: the Dashang Kagyü lineage. Naropa systematized Tilopa’s teachings into ‘the six dharmas of Naropa’: inner heat (tummo), illusory body, dream, luminosity, phowa and bardo. These vajrayana methods, along with the profound meditation practices of Mahamudra, form the core of the Kagyü teachings. Three particularly important texts, often referred to collectively as nang brtag rgyud gsum, are: The Profound Inner Meaning, the Two Sections of the Hevajra Root Tantra, and the Sublime Continuum. In addition, the unique teachings of the Drukpa Lineage include the ‘Six Cycles of Equal Taste’, hidden by Rechungpa and discovered by Tsangpa Gyaré; and the ‘Seven Auspicious Teachings’ revealed to Tsangpa Gyaré by seven buddhas who appeared to him in a vision at Tsari. The Shangpa lineage holds the 'Five Golden Teachings of Shangpa': the root, the Six Dharmas of Niguma; the trunk, Mahamudra; the branches, the ‘three continuities of practice’; the flowers, the ‘two celestial queens’; and the fruit, the deathless, unerring state. Lobsang P. Lhalungpa, “The History of the Kagyupa Order” in The Life of Gampopa, The Incomparable Dharma Lord of Tibet by Jampa Mackenzie Stewart (Ithaca: Snow Lion Publications, 2004), pages 117-139. Jampa Thaye, Garland of Gold: Early Kagyu Masters in India and Tibet, Ganesha Press Ltd, 1990. Richardson, Hugh. “The Karma-pa Sect: A Historical Note.” Journal of the Royal Asiatic Society (1958): 139–164 and (1959): 1–18. Reprinted in High Peaks, Pure Earth: Collected Writings on Tibetan History and Culture, ed. Michael Aris. London: Serindia, 1998. This page was last edited on 17 January 2017, at 04:25.